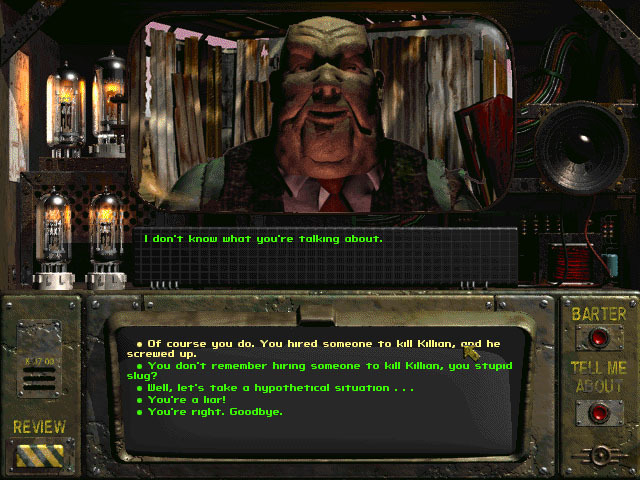 Good Old Review's month of classic role-playing games continues with Interplay's Fallout. It's the year 2161, and decades of war and nuclear destruction have rendered the United States of America a wasteland. Many survivors live underground in vaults, completely unaware of what fresh air and natural light are like. 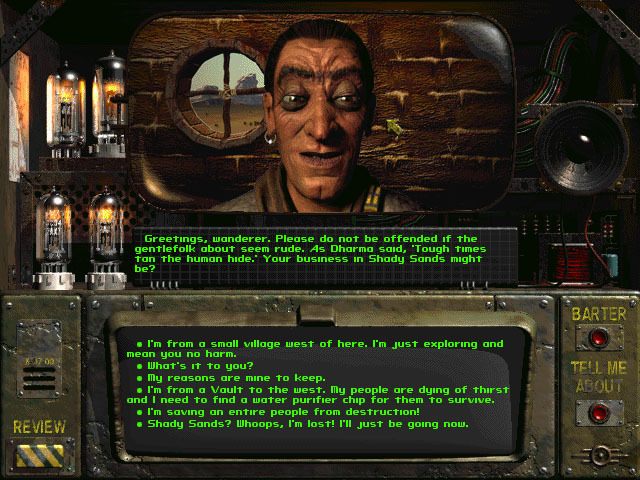 This post-apocalyptic, futuristic setting sounds all too familiar in 2013, but I imagine it was a lot fresher in 1997, when Interplay Entertainment released Fallout. 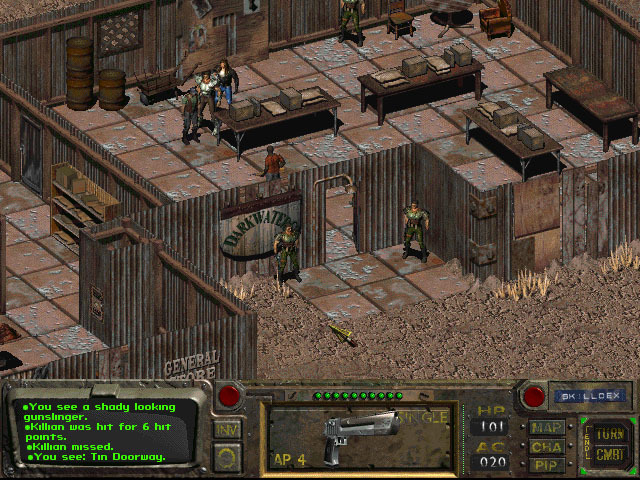 Even after 16 years, Fallout offers an intriguing, sometimes addictive gameplay experience for the first-time player. That said, it's also clearly showing its age and can be really cheap; as a first-time player I often found myself quitting out of frustration, only to jump right back in. 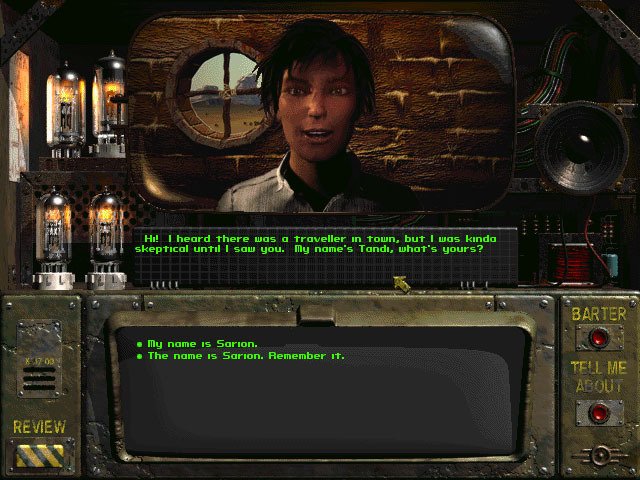 Vault 13 is where the game's protagonist has lived his or her entire life. It may not be paradise, but at least it's safe from radiation, mutants, and the violent gangs that roam the wasteland. 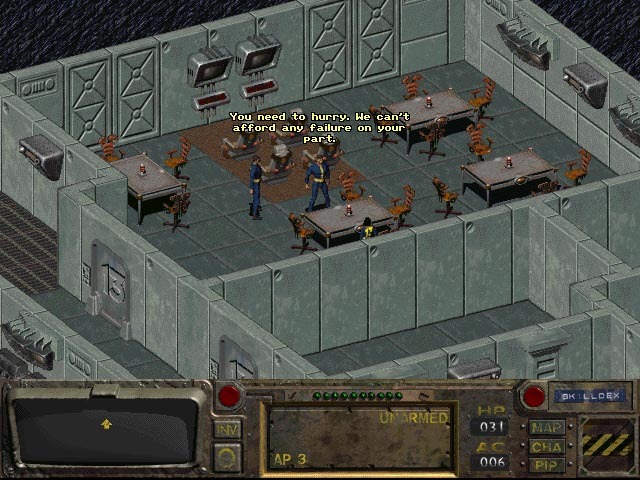 Unfortunately, the Water Chip, responsible for providing fresh water to Vault 13's inhabitants, is broken, and it's up to one inhabitant--the player, of course--to find a replacement. 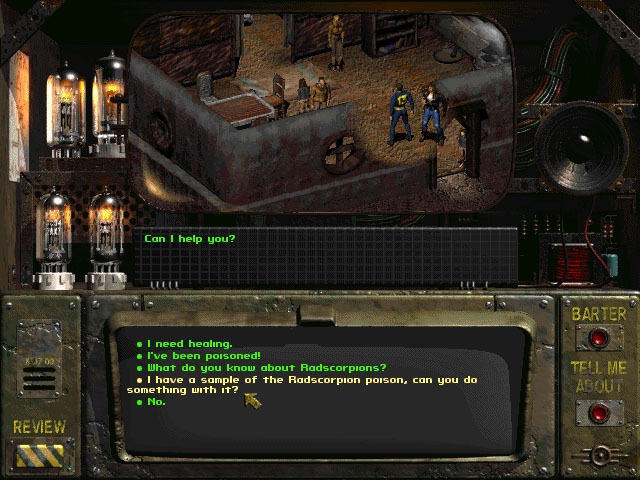 With a Pip-Boy 2000 in hand, the protagonist is sent into the real world for the first time, leaving the safety of Vault 13 behind. For an older title, I was a little surprised at the almost overwhelming amount of information Fallout introduced me to right off the bat. 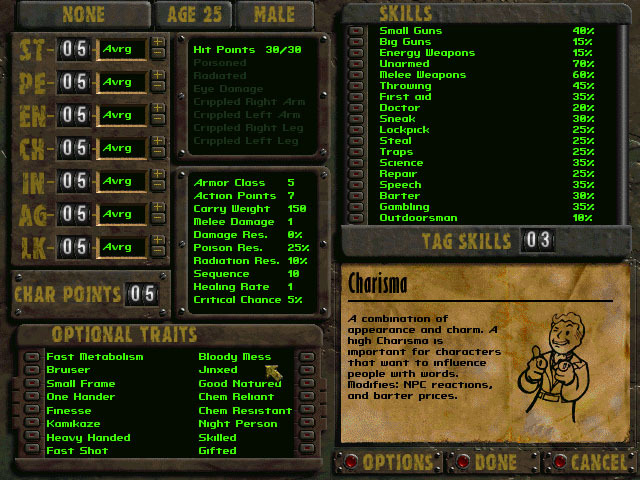 There are three pre-made characters ready to go, and they can be tweaked to each player's specifications. Skills and stats will affect your approach to the game; you can be diplomatic, stealthy, or always ready for a fight, depending on your character. I picked Natalia, described in her character bio as intelligent and resourceful, and chose not to deviate too far from her given stats. Not being familiar with the game, I didn't want to create a character that would impede my progress. After leaving Vault 13, there's almost no direction given to the player, which I found really jarring at first. Part of this is because in the 1990s, game manuals provided much more relevant information, and sure enough there was a tutorial of sorts in the PDF manual. 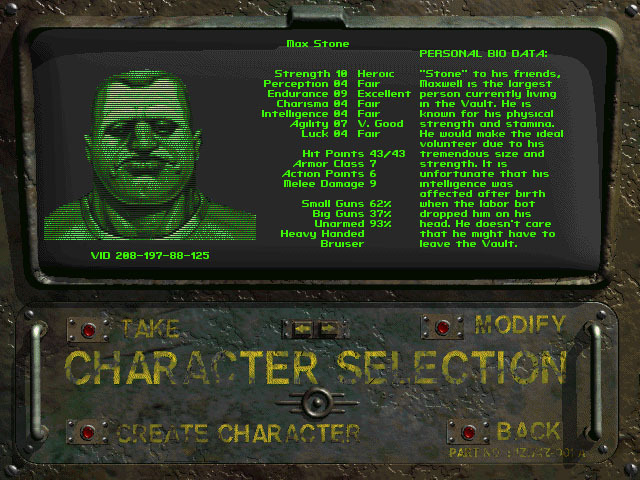 After clicking the icons on-screen I became familiar with my inventory, where I could equip weapons and armor or use healing mechanisms, my skills, and the Pip-Boy 2000. My first attempt at Fallout was not successful. There's an in-game time limit counting down until Vault 13's water supply runs out, and I wasted many of those days running back and forth between Vault 13 and the abandoned, run-down Vault 15 before wandering into a town, saying the wrong thing to an inhabitant, and promptly being murdered. In addition to obvious threats like monsters and gang members, sometimes people will just attack for something you said or because you walked into the wrong door in a seemingly safe area. It's frustrating, but taught me an important lesson about playing Fallout: save often. 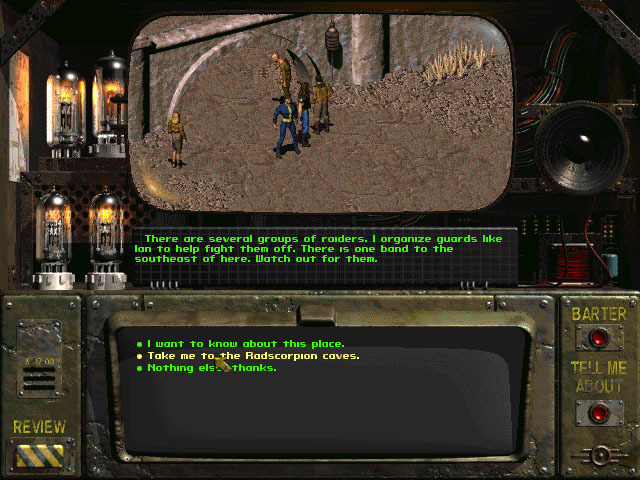 There are plenty of different settings to explore in Fallout, all of which can be found by wandering around the area map or talking to locals to find out what's nearby. From rat-filled abandoned vaults to radscorpion-infested caves, the wasteland is a dangerous place, and I had to learn how to fight quickly. Combat itself is turned-based, but takes place right in the environment and starts as soon as you're approached by a foe. There's no cutting away to a separate battle screen. After equipping my weapon, attacking was as simple as clicking the offending enemy, assuming it was within range. How successful the attacks are depends on a variety of things, including the character's abilities. Thankfully, the game provides a few meager weapons at the start, so at least I didn't have to fight rats with my bare hands. Though Fallout initially frustrated me, I always found myself going back for more, setting aside more modern titles to make time for this 16-year-old game. As a fan of old-school adventure games and RPGs, this one really appealed to me, even though the path to victory was frequently unclear. 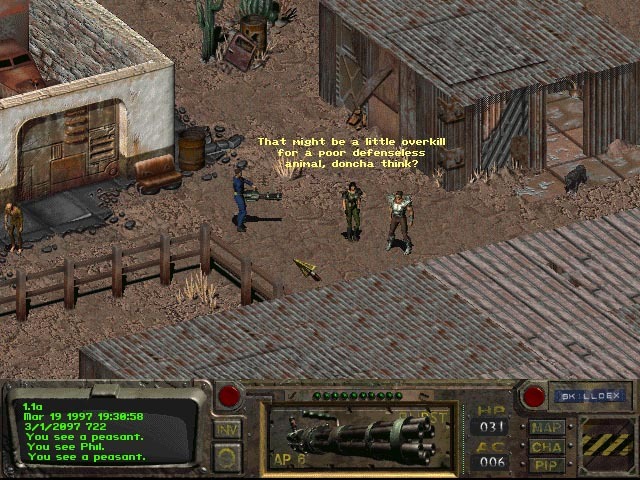 Fallout was my introduction to the post-apocalyptic series, and after a few hours I was left with the impression that I would have adored this game if I'd played it in 1997. In 2013, it loses some of the appeal, but it holds up relatively well for a game of that era. The exploration and combat can be satisfying, and personally, I never get tired of a good post-apocalypse story. It's definitely not for everyone; the cheap deaths and lack of direction are sure to aggravate some gamers. 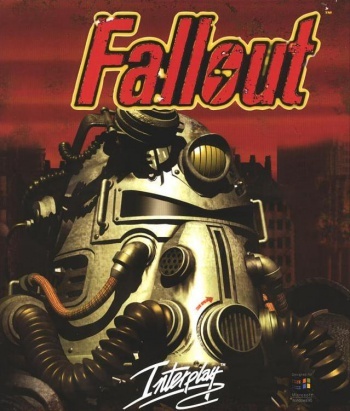 Despite how many times I died at the hands of seemingly harmless citizens or overpowered mutants however, and how many hours I wasted trying to find the right supplies, I enjoyed my time with Fallout, and I'd recommend it to others. This is especially true right now, since the game is currently free at GOG, along with its sequel and Fallout: Tactics. Just remember: save your game. Save your game a lot. Come back on Saturday, December 21st to read Andy Chalk's take on the dungeon crawler Stonekeep.